Getting the right barrel for your M4 can be a harder task than you might think. There are so many to choose from that even knowing which is right for your ammunition is a headache! Thankfully, we’ve compiled this guide to teach you all that you need to know about finding the best barrel for your personal M4 carbine. What is the Ideal Barrel Length for an M4? The first thing to remember is that the barrel length does affect both accuracy and round velocity for an M4. Generally speaking, the longer the barrel, the more accurate your round and the faster your rounds will fire. However, the various barrels you can attach to your M4 don’t affect everyday performance to such a degree that there’s one perfect barrel length for everyone. Instead, consider how fast your rounds need to be moving to accurately hit and/or penetrate your target. You'll generally want a barrel that's 16" or longer since civilians are barred from having barrels shorter than this. Military rifles tend to have barrels that are around 14" long, so if you’re active or reserve military you can use rifles with barrels shorter than 16”. Therefore, the best length range for an M4 barrel for most people is going to be between 16” and 20” long. The exact length can vary depending on how you like the feel of the weapon or what comes with your purchase. Before we get into the best M4 barrels, keep a few things in mind for your own research. These are factors that affect the performance of your barrel and will have a critical impact on your experience. When we talk about twist, we’re speaking of the grooves that are carved inside the barrel’s length that cause the round to spin as it exists. This preserves accuracy over long distances. The twist rate, therefore, is how long is needed to make an exiting bullet spin a full 360 degrees. Twist rate is changed by the caliber of bullet you use, too. To figure out your ideal twist rate for your ammunition, use this formula: Twist Rate = 150(bullet diameter/bullet length to diameter ratio). Most good M4 barrels have fast twist rates because of their standard ammunition size. There are a few good material types that you might find. Stainless steel is always a good choice since it protects somewhat from corrosion. It can over overused, however, and is best for precision shooters. Chrome-lined material can withstand pressure from heat and improve the barrel's wear resistance. Finally, cold hammer-forged material is tough and long-lasting and might be regarded as the best barrel material out there. Lighter barrels will make your rifle easier to carry and/or store. They are also often cheaper than heavier barrels. However, if you invest in a heavier barrel you might find that they last longer and are more durable then their lighter cousins. In particular, you might find a “Hanson” barrel that combines a lightweight profile and can feel easier to carry without some of the durability problems that traditionally light barrels have. Finally, make sure the barrel you get is right for the kind of bullets you’ll be firing. The kinds of rounds you can issue from an M4 include the standard 5.56/.223, .223 Wylde rounds or 5.56x45mm NATO rounds, which are both fired from a Wylde barrel, .300 AAC blackout rounds, 6.5 Grendel cartridges, and 9mm rounds commonly seen in handguns. Now, let’s dig into the best M4 Barrels on the market. Many of these are high-quality for a specific reason, while others are good all-arounders that can fit a variety of shooting needs. Examine each carefully to determine which one best suits your weapon. Our first barrel is the PSA AR-15 NATO Nitride Barrel. 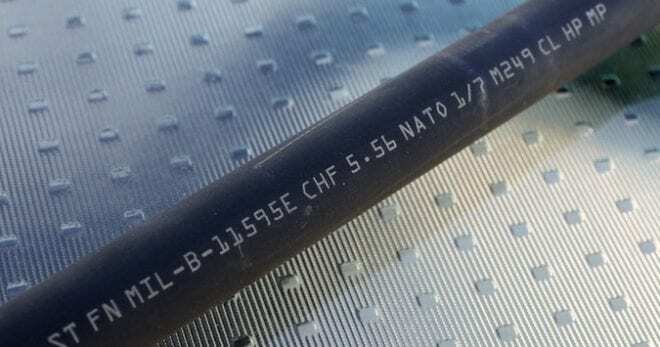 It’s chambered for 5.56 NATO rounds, meaning that your ammunition stockpile is limited to these kinds of rounds only. However, most folks will end up using 5.56 rounds of some kind or another anyway, so this is hardly a real flaw. The rest of the barrel is phenomenal. For instance, it's an exceptionally good length at 16". This means that civilians can make use of this barrel legally. Longer barrels typically have small improvements for accuracy and velocity, too, and that's always a good thing. With a barrel such as this, you'll be able to both hit targets on the shooting range and hunt animals if they infringe upon your property. The twist rate is 1 in 7”, meaning that a bullet will spin all the way around one time for every seven inches that it travels. This is a pretty speedy twist rate that will make for good velocity and accuracy. The barrel is finished with nitride to reduce the friction from heat and preserve its lifetime for longer than it might otherwise. 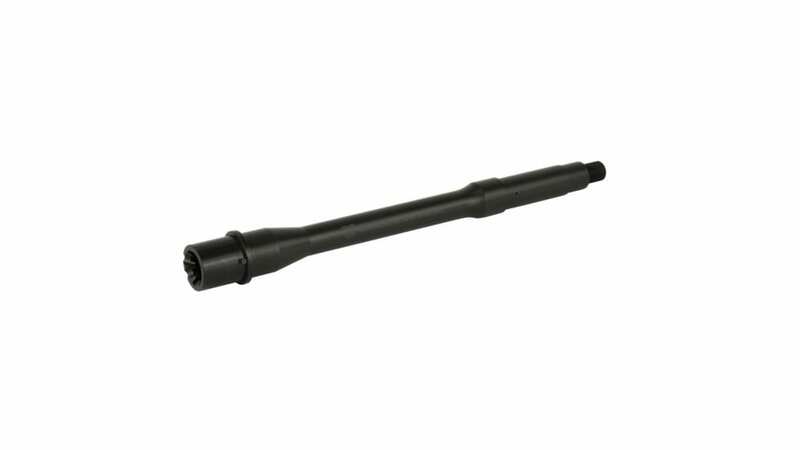 Altogether, the PSA AR15 NATO barrel is a great all-around M4 barrel that provides speed, adds to your striking power and can issue bullets with great accuracy. It's also very reasonably priced, so we'd recommend that any civilian consider picking this up. The PSA AR15 is a dependable, affordable M4 barrel that doesn’t have any major weaknesses. It’s not the sturdiest barrel on the market but it’s tough enough to suit most peoples’ purposes. This PSA barrel is really similar to our best overall pick. It too has a 1 in 7” twist rate and the same 16” length, meaning that it is also usable by civilians and presents good speed and accuracy for every round issued from its mouth. The biggest difference between the two is its profile (or shape, if you will). This barrel has an M4 profile, so it’s designed from the get-go to be fitted perfectly into an M4 chassis or base without any trouble. While you can slot many barrels into chasses with a good gunsmith, this barrel will require the least effort or cost. Other than that, both barrels are more similar than they are different. Many of the same perks above apply here; it provides good range and velocity and the accuracy is solid, especially when you’re within the intended range of standard M4 shooting. Animals are very much within your striking power should you decide to use the weapon in that way. Depending on the price as the market fluctuates, you may consider going for the previous PSA barrel we reviewed, as their prices might flip flop over time. These two barrels are so similar that they both receive high marks, and you can’t really go wrong with picking either of them so long as you use 5.56 NATO ammunition. The PSA barrel is another great offering from the company that has slightly better value for money since it’s built for M4 chassis specifically. However, both this and the above barrel are more alike than they are different. The Anderson Manufacturing barrel has some similarities to the other barrels we’ve examined so far. Like the others, it’s perfectly fine for civilian usage due to its 16” inch barrel length. 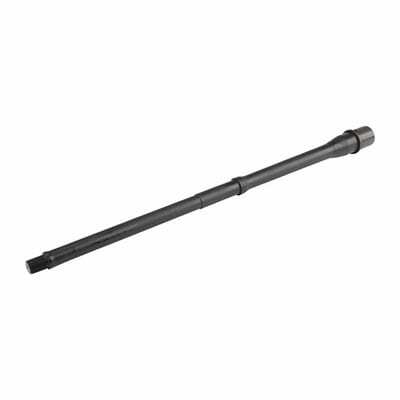 The barrel is made of durable metal and has a Parkerized finish. This is jargon for a particular corrosion-resistant coating that makes it a great pick if you’re going to be firing off a lot of rounds at once, which tend to generate intense heat and powder residue. The barrel can be used with the most common ammunition type for M4 weapons: standard 5.56 rounds. This makes it ideal if you’re a regular civilian without access to more specialized ammunition types. The twist rate is a little lower than the other two barrels listed above; its rounds rotate once only every eight inches. However, this is still a very competitive rate and is more than fast enough to generate good accuracy and velocity upon emergence from the barrel’s mouth. If you order this barrel, you’ll get free shipping included, which might edge it ahead of some other barrels if you’re on a budget. It’s not the cheapest selection on our list, although due to its corrosion-resistance, investing in it might save you some money in the long run. This barrel is a cost-effective product that will last for a long time due to its Parkerized finish. It has a decent twist ratio and a length that's great for civilian shooters, along with a chambering system for the most common type of ammunition for M4 weapons. Here we have a shorter barrel that will find some popularity if you’re active or reserve military. Its barrel length is only 14.5” long, so civilians will not be permitted to own this barrel under most circumstances or states. This can be seen as a plus or a minus depending on your perspective. A shorter barrel is lighter and potentially easier to swing around while switching targets, but it also comes at the cost of slightly lower accuracy. However, the accuracy and velocity offered by the barrel are good enough for almost every shooter on the market. It has a good twist rate of 1 every 7” and is profiled for M4 chasses. This is a great addition to any rifle that originally came from the military, or if you need a replacement for your service weapon that you didn’t want to leave behind. The corrosion finish that coats the barrel is particularly effective. As this rifle fires common 5.56 ammunition, bursts of rounds are common and the resistance will help extend the barrel’s lifetime beyond that of some competitors. The CMV barrel is a good shorter barrel that provides great stopping power and accuracy thanks to its great twist rate. A corrosion-resistant coating will keep it working flawlessly even through many rapid bursts of fire. Colt brings us a fantastic, long-lasting barrel that’s apt for heavy-duty shooters that enjoy the power behind NATO 5.56 rounds. It’s optimized for that kind of ammunition and is built to handle the explosive power they provide. It’s a shorter barrel, too, and makes up for it by being rather stocky altogether. The barrel is 14.5” long, like the previous barrel we looked at, so only those in the military or in the reserves will be able to use it barring a few exceptions. That being said, it’s very accurate and durable, ready to last you for many years of use and service. The heaviness of the barrel is actually a little tricky to get used to. Included with the purchase are some threads for a muzzle device; this added functionality might appeal to you if you like to place attachments on your M4 regularly. Muzzles for shorter-barreled weapons are already good ideas to control recoil, and if you’re using 5.56 NATO rounds you’ll definitely appreciate the extra help from a good muzzle. The barrel’s sight tower is a great addition that adds a lot of value to the product. It is rather pricey, but when taken together with the added benefit of the sight tower it’s much more appealing as an entire package. The Colt barrel is a pricey but worthwhile choice that packs a lot of dependability into its shorter barrel length. It can last for a long time and has threads for adding a muzzle to its end, as well as a sight tower that’s a good addition for any M4 chassis. This short-length barrel is one of the best we’ve seen of the archetype. It’s barred from civilian use, but if you’re able to purchase this barrel you’d be silly not to. 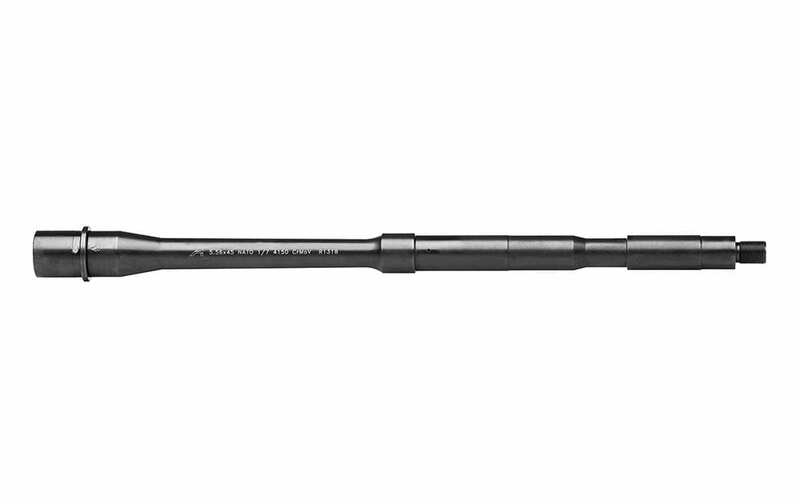 It packs a lot of velocity thanks to its great twist rate, 1 in 7”, combined with the short barrel length at 10.5”. This means that NATO rounds that emerge from the barrel will be wicked fast. Accuracy might suffer a little, but the weapon will still be plenty effective so long as you’re within the intended range. The barrel is coated with a nitride finish to prevent corrosion as you fire bursts of the NATO rounds in rapid succession. There are also threads for an attachment at the end, just like with the previous barrel we reviewed. This functionality automatically kicks up the barrel’s value in our eyes. When all of its aspects are considered together, you’ll find that it’s an exceptional attachment for any rifle if you like the features offered by shorter barrels. The Rosco barrel is one of the best short barrels on the market. 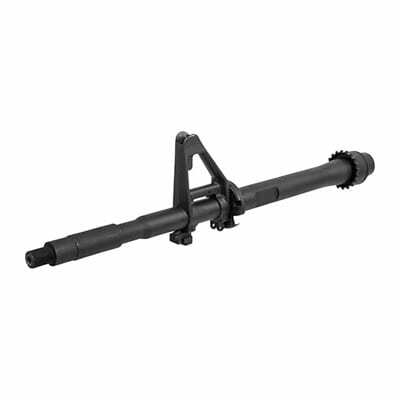 It offers high velocity, good accuracy, and threads for screwing on an attachment at the end. The Brownell Premium barrel measures in at 14.5” inches long, which is still too short for civilian use but is plenty long enough to be enjoyed by military folks. If you like moderate-sized barrels, this is one of the best. It has a good twist rate at 1 in 7” that combines with its well-built steel construction. The barrel is coated with black nitride to reduce friction and pressure damage from firing a lot of its 5.56 NATO rounds at once, and the entire barrel is sturdy enough to handle sustained fire over long periods of time. The gas port has some dimples built into its surface to lock gas blocks into place. This will prevent shuddering as you fire the weapon and ensure that your experience is as smooth as possible. This might be very important in an actual live-fire situation! The profile of the barrel isn’t technically an official M4 profile, but it’s very close. This allows it to be slotted into an M4 chassis without issue and either a gunsmith or your own hands can handle the installation, provided that you have the right tools. The Brownell Premium barrel, while pricey, makes up for its cost thanks to its amazing construction and quality. It can handle the punch of 5.56 NATO rounds while taking advantage of a moderately-sized barrel to provide great velocity and accuracy even at extended ranges. The profile is perfect for many M4 bases, too. Finally, let’s look at the Daniel Defense Barrel. 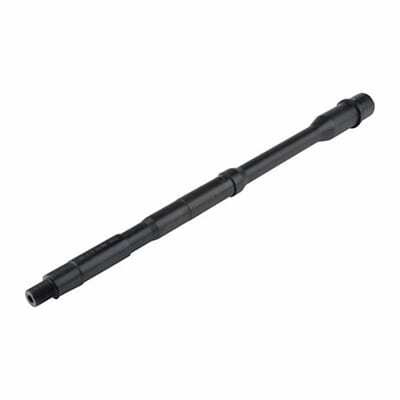 It’s made from hammer-forged chromium-molybdenum-vanadium alloy steel to provide some of the best durability and accuracy you can find in the barrel market. This alloy will allow you to fire your weapon for extended periods without suffering accuracy drop ops. Most barrels aren’t made with this kind of material, and the price reflects that. Still, the amazing quality offered by hammer-forged alloys more than makes up for the price. Its length is 16” so civilians or military shooters can use it, and it takes common 5.56 ammunition. 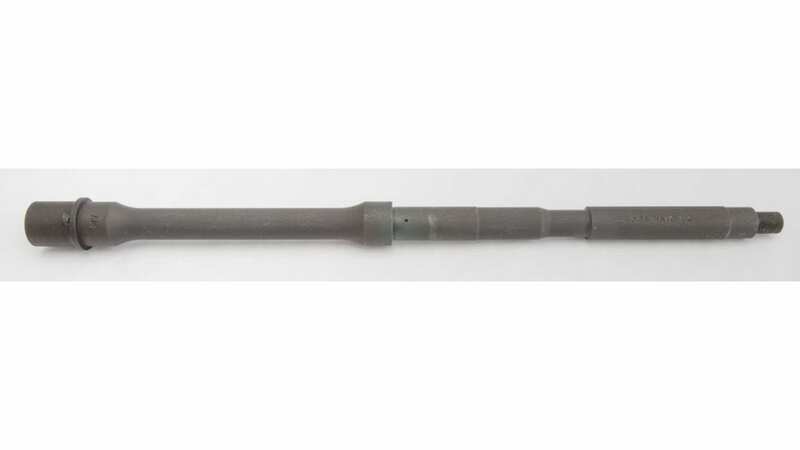 The barrel is also coated in a manganese phosphate material that will extend its lifetime by reducing surface wear, preventing the bullets from damaging the barrel over time as they emerge. The twist rate is 1 for 7”, fast enough for virtually any shooter and any occasion. This is a great barrel for virtually anyone who likes to fire rapidly for streaks or longer bursts. It’s also a great barrel for lengthy target practice. This barrel is made from a hammer-forged alloy that provides amazing durability and preserves accuracy despite its weight. This allows you to take full advantage of its fast twist rate and great length to hit targets on the very edge of your effective range. To begin with, you’ll need a few tools, such as a wrench, an AR-15 Armorer’s Multi-Tool, a Leatherman Nut and some Pin-Out tools, as well as a few hammers. Some oil and gloves are good ideas, too. Make sure that your gun is unloaded before you begin. Remove the charging handle and bolt carrier before removing the lower half of the carbine. Next goes the top handle. Then you can put the gun in the Armorer’s Action Block and remove the flash hider and front sight. Use the Multi-Tool to get rid of the barrel nut. After that, you can remove the barrel by pulling it and replace it with your new one. Simply put the gun back together the way you took it apart. With all of these tips, you're well on your way to finding the best barrel for your M4 carbine. Hopefully, we've shown you a great pick from our list above. Remember to pick a barrel that matches your ammunition type and have fun out there!